To reach “iconic status” is an amazing thing. Cars, guns, motorcycles, and some people certainly make the list. But, what about fashion items? The Swatch? No. Shoulder pads? Certainly not. Leggings from the 1980s? Nope, even though they’re trying to make a comeback. But there is one fashion standout that we can all agree on that has been elevated to iconic status and that is the leather bomber jacket. The inspiration for Satchel & Page stems from a WWII map case owned by Daniel’s grandfather. The fact that it’s over 70 years old and looks amazing made Daniel question why he couldn’t seem to find modern day pieces created with such dedication to longevity. Satchel & Page was formed and their designs are based on items created in the 1940s. They launched their business via Kickstarter with much success. Now, they’re looking to expand into making leather jackets and have returned to Kickstarter. And, not surprisingly, their campaign has resonated with many folks there and they’re more than fully funded. 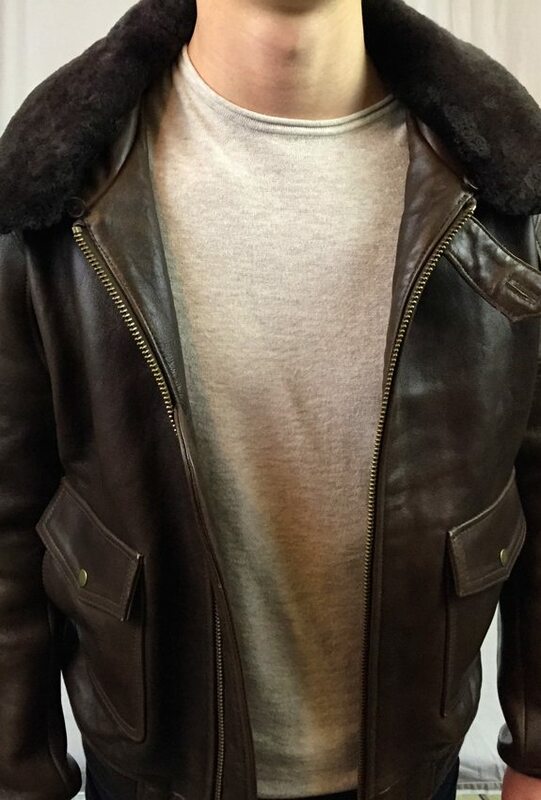 The Satchel & Page Leather Bomber Jacket appears to be inspired the classic G-1 Leather Flight Jacket. This jacket was brought to use by the U.S. Navy in the 1930s, and standardized by the Navy in 1940 as the M-422A. In 1943 this jacket, named by the Army Air Forces and the Navy as the ANJ-3 (Army Navy Jacket 3), replaced the iconic Army Air Forces A-2 jacket, hence the name of ANJ-3 (vs. A-2). Over time the designation settled upon was G-1. One of the most modern day versions of the G-1 can be seen in the movie “Top Gun” with good ol’ Maverick sporting it in multiple scenes. Full grain, French calf leather, which is stronger than lamb, softer and more flexible than cow. It’s the ideal leather for this type of jacket. The leather is chrome tanned and then re-tanned using a vegetable process. The chrome tanning keeps the leather soft and gives the jacket resistance against scratches and rain, and the veg re-tanning brings out the grain in the calf and enhances its aging characteristics. The jacket is expertly assembled and as mentioned, substantial. That weight is attributed to the high quality components – quality leather, thick shearling collar, nicely weighted liner, and heavy duty zipper. *This is a prototype jacket and as such certain design elements and components of the jacket may change. 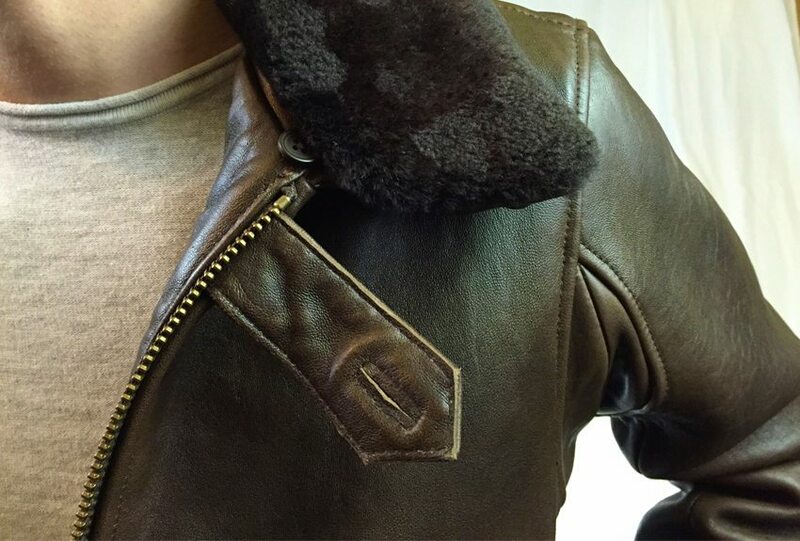 According to Daniel at Satchel & Page, the mechanism of removing and attaching the shearling collar will be upgraded. As this is a prototype, I’ve only had a short window of opportunity to gauge the functionality of the jacket. And, it’s size is limiting for this particular task too (the prototype is a slim medium size). However, I’ve had 3 different (small, thin) guys who benefit from such a slim build try this jacket on and all 3 have asked if they could keep the jacket. The initial reaction when you hand the jacket to them is just as I described earlier…all 3 of them said, “wow – this thing feels amazing”. Then, they put it on and each, in their own way, told me I was going to have a hard time getting it back from them. They all agreed that it feels fantastic and fit well. The pockets were easy to access (top snap pockets and slip in side pockets). The interior pocket is a nice touch for cell phones, wallets, or other small accessory storage. Remember this too; even though the waistline and wrist cuffs are fabric, they too list last forever. 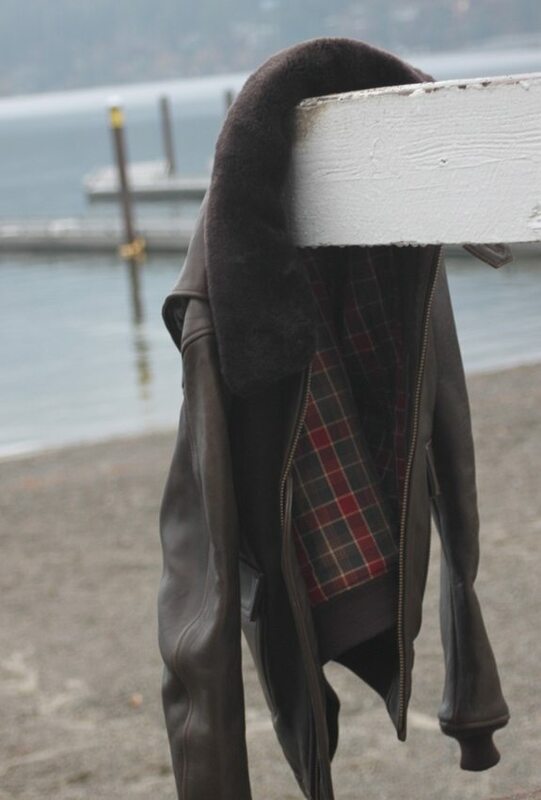 Take a look at a vintage G-1 and you’ll see that those pieces wear just as long and hard as the rest of the jacket. So, fear not. Even if those pieces do wear out prematurely, a qualified seamstress or tailor can easily replace them. As expected, all 3 of the guys who put this jacket on were ready to go hop on a motorcycle or climb into the cockpit of their airplane, haha. Seriously though, the jacket elicits a certain attitude and projects a feeling, well…manliness. This is a good thing. It definitely hearkens back to the days of what we consider the Greatest Generation. In those days, this jacket wasn’t necessarily a fashion statement – it was a functional piece of attire for pilots and flight crews. In today’s modern version, such as the Satchel & Page Bomber Jacket, it is a signature fashion piece. And…it looks oh so good! The Satchel & Page Leather Bomber Jacket definitely qualifies as a great purchase. At the Kickstarter price of $455 for this jacket, it is a bargain in the quality leather jacket market. The Kickstarter campaign ends Tuesday, December 2nd at 7pm PST. In addition to this fantastic rendition of the classic G-1 bomber jacket, Satchel & Page is also offering three other fine looking jackets in their initial line up. Check ‘em out and get one for yourself. This is also the perfect time to order one for that special someone on your holiday shopping list. 6 Comments on "Satchel & Page Leather Bomber Jacket Review – $455"